My name is Rob de Veij. I live in a village near Amsterdam in the Netherlands. My IT career started in the early eighties first as mainframe operator and later as developer of assembler, RPGII and Cobol programs. In the nineties I was an Unix sysadmin and system programmer. In the Unix environment I used shell scripting and C programs to do the things which had to be done. Since the last ten years I'm working as an Infra Engineer in a Microsoft Windows environment and there I use C# and PowerShell to build tools which helps us to do our work. Started writing RVTools just for fun in my private time. In 2008 I released the first public version of RVTools on the internet. For years and years I used the information from the internet now it was payback time! Since 2007 I'm working with VMware ESX. 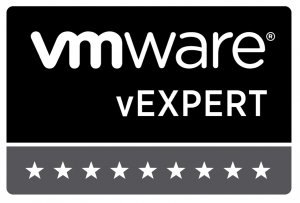 In 2011, 2012, 2013, 2014, 2015, 2016, 2017, 2018 and 2019 I received the VMware vExpert award for my work for the VMware virtualization community.